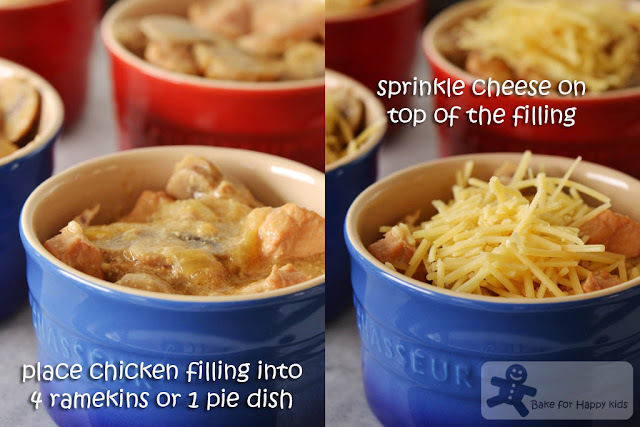 ... especially this easy chicken pie recipe. I don't have to brown the onions, chicken and mushroom initially. I don't have to use any pre-cooked or pre-roasted chicken like what I did at here, here and here. The chicken used in this recipe is actually 100% cooked from scratch! 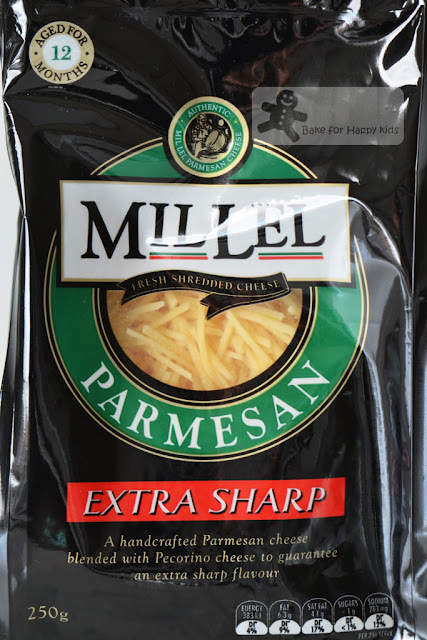 I don't have to pre-cook the bechamel or any creamy sauce. I don't have to cook it with any hot boiling stock. 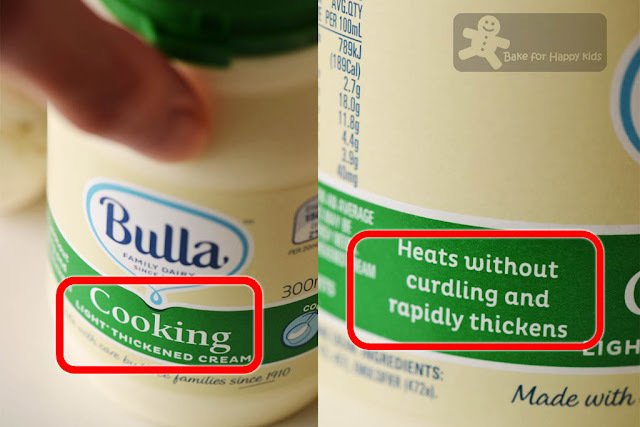 I don't have to worry that the creamy sauce will split. All I need to do is to assemble all the pie fillings ingredients in one pot (or a slow cooker) and leave it to cook with low heat for 3-6 hours or until the chicken is tender and the sauce is reduced. That's it! I'm amazed that 1) the chicken pieces are eventually beautifully browned! 2) the sauce is creamy and yummy and won't split!!! 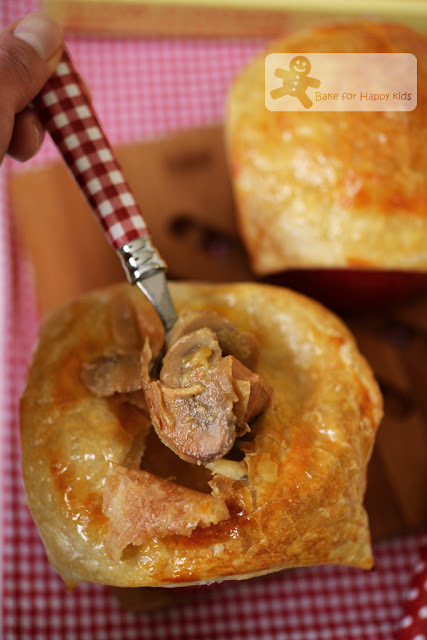 When I want to eat the pies, I transferred the fillings into a pie dish or ramekins, placed Parmesan cheese on the filling and then a ready rolled puff pastry on top of the cheese and bake the pies for 15 mins...So easy and these pies are so comforting to eat! Skinless chicken breast??? 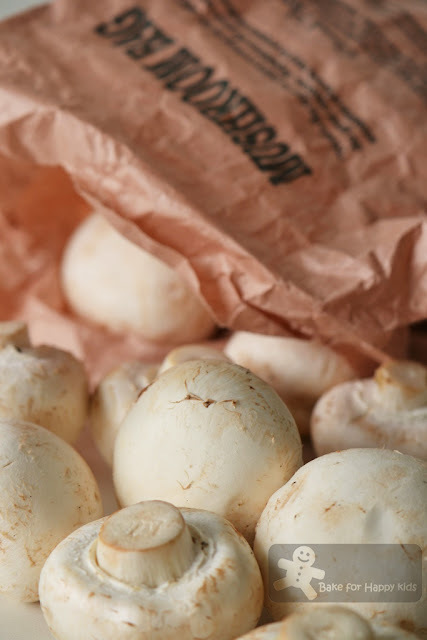 Will it be too tough and dry after cooking? I will show you the answer later. 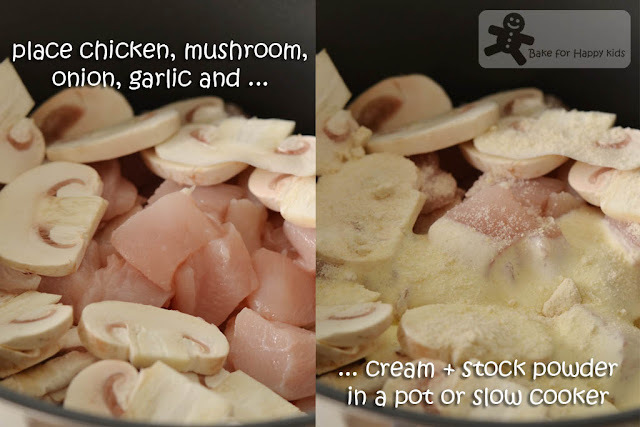 Assemble all in one pot or a slow cooker. 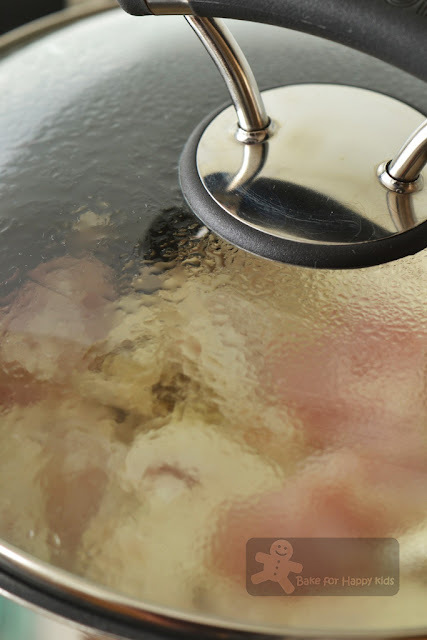 Leave it to cook with cover and low heat for 3-6 hours or until the chicken is tender. Do not be alarm if the cream looks like it has split. It will be ok later. Absolutely no worries! At this point, I walked away to do other things. After at least 3 hrs of cooking, the filling will look darker in colour and the chicken will be nicely browned. 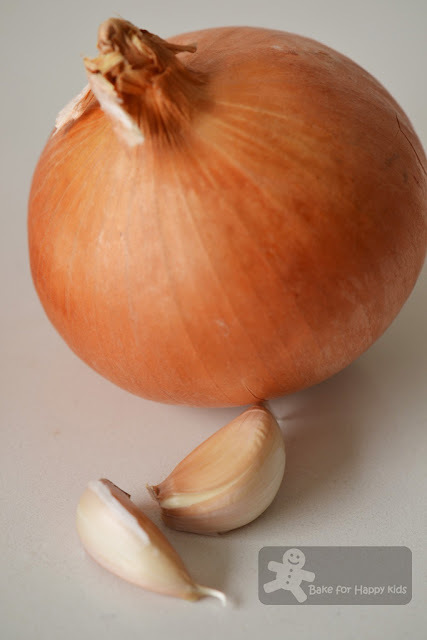 To reduce the sauce, cook the filling uncovered until the sauce is reduced according to your liking. You can either stir in the 1/2 cup Parmesan cheese into the filling and cook it for 15 mins or sprinkle on the filling just before baking. 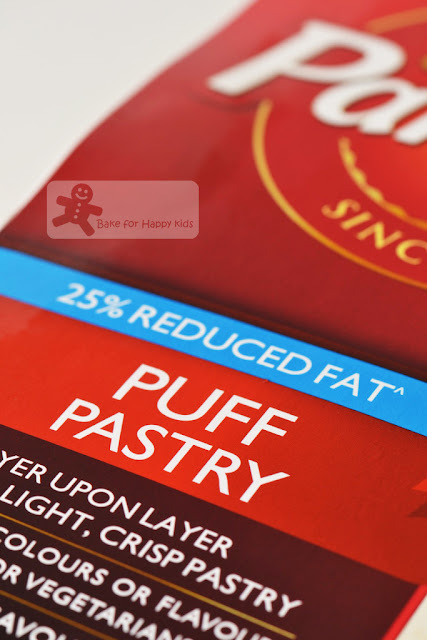 As usual, I always prefer to use the fat reduced fat ready rolled puff pastry and I need to thaw and use just one sheet. It's dinner and baking time and so I did these. Place puff pastry over the top. Trim the edges (or not - my family and I prefer not to waste any pastry :p). Brush the top lightly with one egg which is lightly whisked. Bake at 180°C for 15 mins or until the pastry is puffed and golden. See! 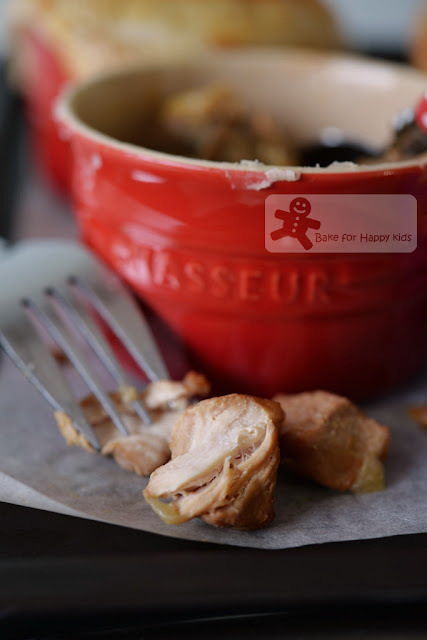 The chicken breast pieces are beautifully browned! And they are not dry at all being flavoursome and tender. Do you know that Slow Cooker Central is currently the No. 1 selling book in ABC Book Shop? 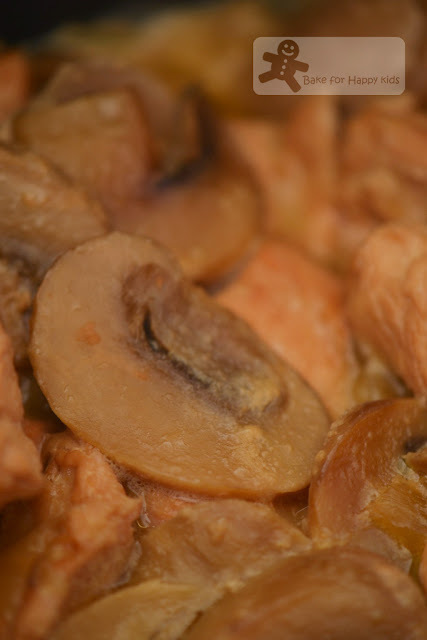 I'm impressed that a slow cooker and the recipes including this chicken and mushroom pie recipe from the book, Slow Cooker Central can make the lives of busy working people so easy. Thanks to Slow Cooker Central! Busy people like us can eat well and don't have to be hungry... LOL! 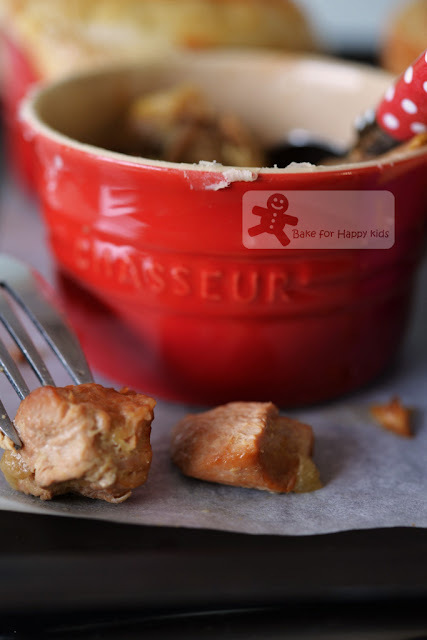 I hope that you like this recipe as much as I do. 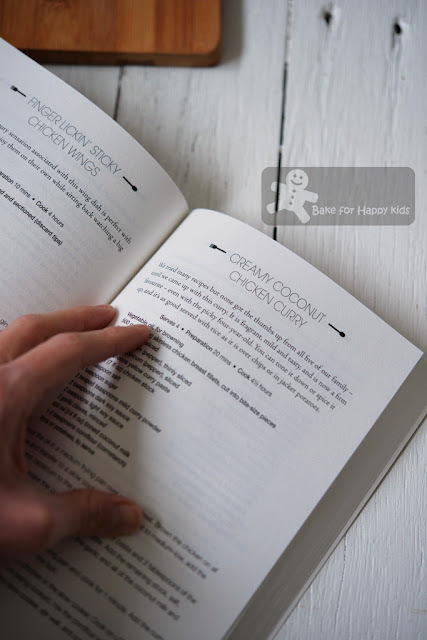 It is one of the chicken recipes that I have seen in the book, Slow Cooker Central by Paulene Christie and there are more than 250 recipes that you can find in this amazing book. Besides Chicken, there are chapters like Soup, Snacks and Light Meals, Beef, Sausages, Lamb, Pork, Game, Seafood, Vegetable and Sweets. 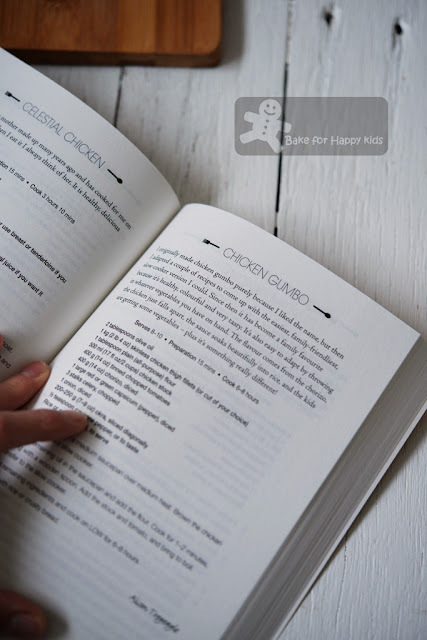 Just the chicken chapter itself, I'm seeing many amazing recipes with flavours from around the world. Chicken Gumbo with southern American flavours. 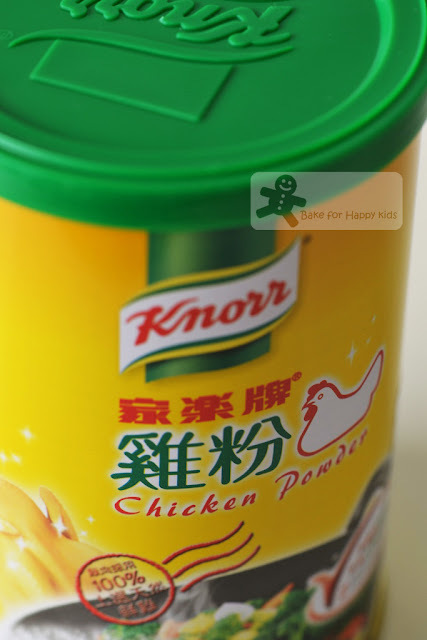 ... and many many many chicken dishes with Asian influence. 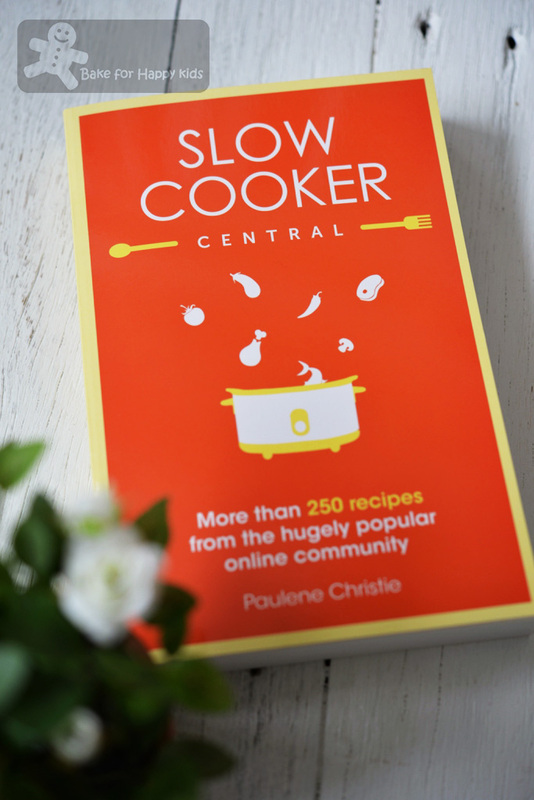 If you are a busy working mum like Paulene Christie, the author of Slow Cooker Central book, you gotta have a slow cooker and this book! Thermomix, KitchenAid Cook Processor or a humble slow cooker... Now, I say eeny, meeny, miny, moe... LOL! If you have a slow cooker and like to buy this book, it is available in most book stores at RRP AUD$24.99 or if you are lucky, you can win one here! This giveaway is open to ALL international readers and the submission ends on 6 August 2015. Good luck! Before ending this post, I like to thank Harper Collins Australia for giving me this opportunity to do this review. I like to make a disclaimer here that I'm not paid to do this review and like to share my most honest opinions about this book. Look delicious Zoe! 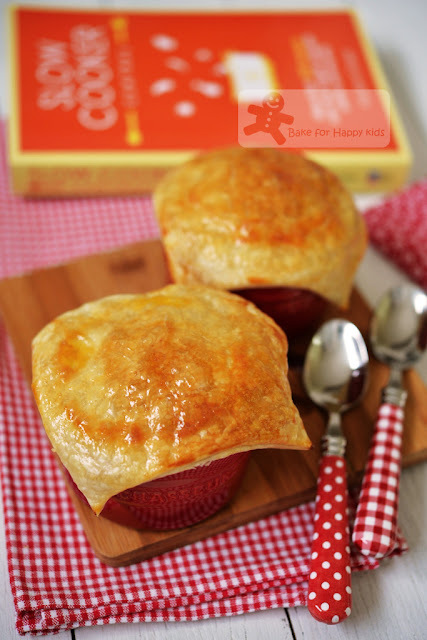 I love pot pies!! Thank you for sharing this recipe. You make it so easy. Oh this is so easy and delicious looking! I have no excuse, I can make this today if I had all the ingredients! I already have the puff pastry in the freezer! I totally will be making these soon! 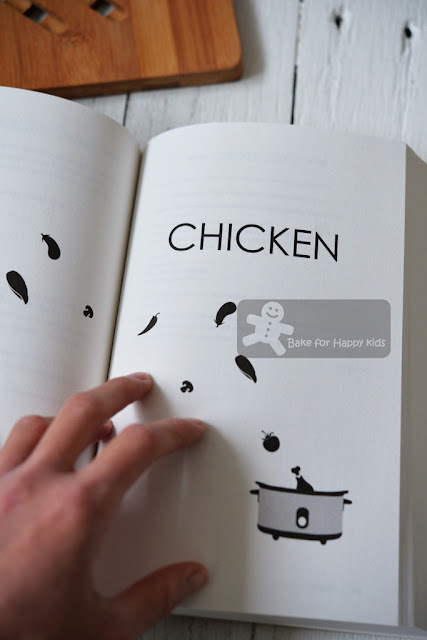 Now you are making me curious about this book Zoe :) Your pot pie looks perfect to me too!! The chicken is perfectly cooked just the way I like mine in pies. 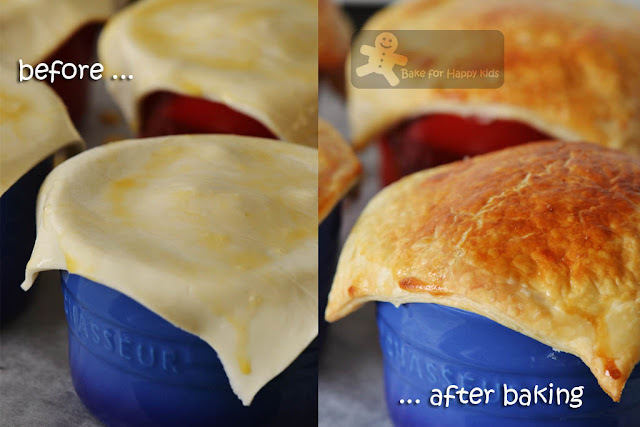 Yay, this time you used puff pastry! 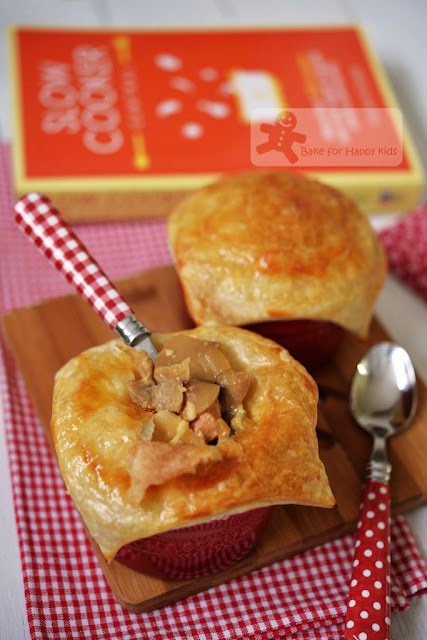 I also use frozen puff pastry, Kawan brand, very nice.. My filling more simple and fuss-free, I use cream of chicken, haha..
Looks so tempting! Love the filling.. So yummy-licious! Like your "Nom nom nom" ... wished I could eat it ^-^! Wow! That does look easy. And tasty! Besides, who doesn't like pot pies? This is a winner -- thanks. Hi Zoe! Your pot pie looks so tempting and I'm tempted to make this. But I got to go get ramekins and puff pastry. One pot dishes are perfect for weeknights.